I recently watched the new Tick series that's running on Amazon Prime. While the performances and production values are fine, for me this version really misses the mark. For some reason the show is played very straight, with only Peter Serafanowicz' Tick acting in a larger than life manner (and not even all that much). Almost all of the hilarious absurdity that made the comics, cartoon and Patrick Warburton TV series so enjoyable is gone in favor of more standard superhero fare. Perhaps they wanted to set the show apart from other incarnations, but for me it's a misfire. Personally, I enjoyed the new show. But, this comment isn't to disagree it's to applaud this new cover which I find to be inspired! Super awesome!! How about the silver age Mary Marvel and X-men's Marvel Girl? If you wanted to recapture the humor of the cartoon series, wouldn't the recent WB animated version of Krypto have been more fitting? Deliberately geared towards pre-school audiences, it was animated (and narrated) in a delightfully Old School way. It even aired on Boomerang (a spin-off of Ted Turner's Cartoon Network that was initially supposed to show only classic Saturday morning cartoons) about ten years ago! I ended up liking the new series once it founds its voice in the second half of the 12 episodes. It isn't the original, but I'll take it. I tend see the new Tick as kind of like Adam West's Batman stuck in the world of Christopher Nolan's Batman movies. When it comes to the Tick, I'm the embodiment of "the first is your favorite" -- in my case, the cartoon. Then again, what pushes that version for me is the presence of American Maid, The City's one serious (or at least competent) superhero with a great pun for a name. Others have suggested, and I agree, that it would be fitting to find her on this blog discovering that she's the daughter of Steve and Diana Rogers! Speaking of Steve Rogers, it just occurred to me this morning that he might be the older brother of Mr. Fred Rogers. There goes the old neighborhood! Or Underdog vs. the Underminer. "Krypto... I only have one thing to say to you... SPOON!!!!" Extending Paul's suggestion: (Superman, last panel) "Hm... I'm used to Krypto's howling by now, but I could swear that it sounds like the word 'spoon.'... Nah." Jay042 said, "I tend see the new Tick as kind of like Adam West's Batman stuck in the world of Christopher Nolan's Batman movies." I thought the main character was played like Christopher Walken channeling Adam West. This is not either the old cartoon or the previous live-action series. 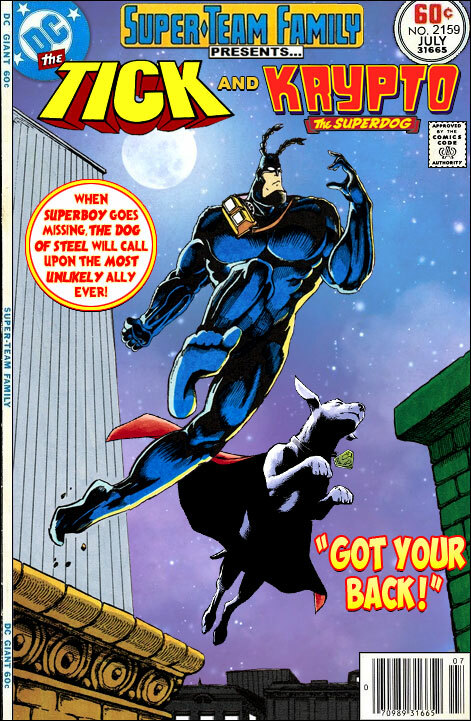 Yes, it's more straight-up and "Dark Knighted," but the Tick remains the solid, true-blue :) hero we've always known. Gets many great lines. "...it's not easy to make Superdog work." Oh, I don't know. Maybe a candle-lit dinner with Lassie over a can of Alpo? Btw, Ross: have you ever teamed (this) Big Blue with Spidey? I've been watching the original Tick cartoon with my daughter. She's become a fan. That show was a favorite of mine when it first aired! I liked the Savage Dragon cartoon better than the Image comic. I read a little blurb from Ben Edlund about the tone they were shooting for, and I feel they rather hit the mark. The original comic series and the Cartoon series that so closely adapted it, was a loving comedic send up of mostly Silver and Bronze age comics and comics tropes. The Live action TV series was more of a comedic take on the non-adventuring side of super hero life.. with one idiot among a few basically competent heroes. And the new live action series take it's cues from the older comics, but this time the idea is to have a comedic take on modern super hero comics and super hero media like movies and TV shows from the last fifteen years. Hence a more serious take on Griffin Newman's version of Arthur, and all the tragedy in his backstory. And I would beg to differ on only the Tick getting to be a little on the crazy side in the new show. Scott Spiesers "Overkill" is obviously a homage to characters like Punisher and Red Hood, maybe with a bit of Winter Soldier and so on, and he's laughably abnormal as the show goes on. Absurdly incapable of interacting with normal people. Much like the Tick, just in a different way. Honestly, once Overkills backstory was revealed late in the seasons run, I was actually kind of impressed at the amount of detail and world building the show had going for it. And of course, casting Rorschach himself, Jackie Earl Haley as the big bad was a stroke of genius.. he was absolutely perfect. Follow STF: The Lost Issues on Twitter! Please Help STF: The Lost Issues continue by becoming a Patron at Patreon! Support STF: The Lost Issues!